Saturday 23rdJune was the day of Castle tournament. A beautiful, peaceful, sunny morning in Manchester as we prepared to make the short trip down the A500. Unless you were my housemates, then you were rudely awakened by a horribly hungover Scotsman getting rid of the previous nights ‘one or two beers’. A pint of water and two paracetamol for breakfast were enough to get me out the house to be rescued by Jay who kindly agreed to drive since I certainly couldn’t. The morning of korfball got off to a great start as we were lucky enough to have a break for the first game, just enough time to collect ourselves and mentally prepare for the day ahead. For the morning we were in a group of seven teams where we got the opportunity to face teams we rarely meet like Manchester City, Lancs Uni, and Leicester. It took us a few games to get our rhythm but when we settled we got strong wins over Lancs Uni and Leicester, ending the group on three wins and a draw from our six games. After a short break for a barbecue lunch we were back in action. The afternoon saw us placed in the top section of the tournament, getting the chance to play more exotic teams like Warriors, Manchester City, and Leeds. The first game of the afternoon saw us come up against City. A close match, fought well by both teams ended in a draw – not a terrible start to the afternoon. After just losing by one goal to Warriors, Leeds were straight back on to play us. We got off to a flying start with two very quick goals helping us to a very comfortable win. After that performance we were convinced the trophy was ours. Then we played Warriors. The trophy was definitely not ours. Ending that group stage with a draw and a win, we finished 2nd in the group and got ourselves a placing game for 5th/6th position. Having lost to Castle in the morning group stage, it was not a great feeling to be facing them again for the placing game. We were desperate to get revenge for the earlier beating but unfortunately the tiredness and the heat of the day just got to us and we narrowly lost the game by two, or three, or maybe even five goals. 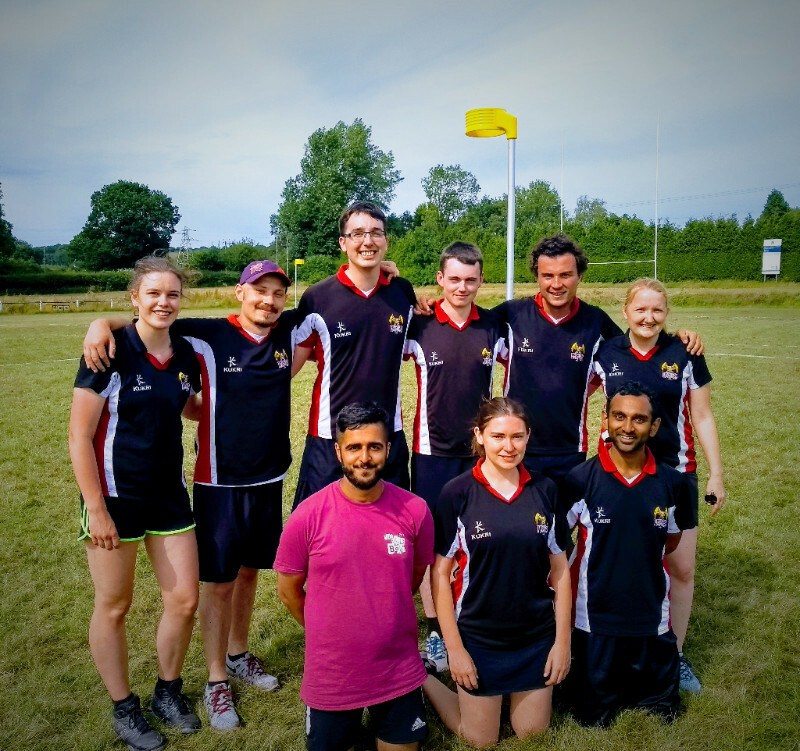 All in all a great day of korfball with some amazing performances from a team of players that never play together. 6th place from 14 teams and a hell of a lot of goals was great and I was really proud of what we were able to come together and do. As seems to be a new Hawks tradition (two years in a row counts as a tradition, right? ), we had a fantastic raffle performance. Salman won a cute, cuddly Oleg BB8 that Charlotte proceeded to undress for some reason, and the top prize of an Amazon Fire tablet. I sit here writing this while drinking my raffle wine, and Rob managed to spend £5 on tickets and not win a single prize. But he isn’t still sunburnt a week later so who’s the real winner?